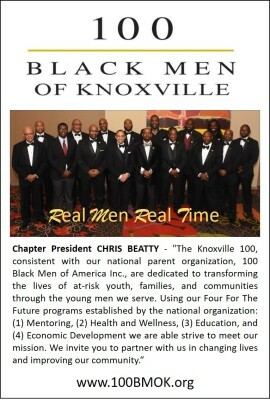 Expose mentees to role models in the 100 BMK and the Knoxville Community. Engage mentees in cultural and educational activities. Encourage mentees to develop new ways of thinking through life skill development, career exposure, and leadership building. Encourage mentees to develop an appreciation for community service. Assist mentees in achieving academic excellence through tutoring, counseling, and financial awareness to help pursue education beyond high school. Be responsive to positive feedback and direction. Show respect for self and others through behavior, interaction, language, dress, and overall conduct. Provide copies of periodic grade reports. Support 100 BMK events such as the gala, golf tournament, health fair etc. The 100 Black Men of America, Inc., believes that education is the key to opportunity. The national organization and local chapters have awarded scholarships to mentees and other community youth's totaling well over 1 million dollars over the past several years. Chapters across the United States and in other parts of the world regularly operate weekend academies, college entrance exam preparation courses, and tutorial programs to help mentees achieve academically. The Knoxville 100 has involved mentees in a variety of educational activities over the years and continues this key component of our Mentoring Program. The chapter has awarded both general scholarships (application.doc) to local graduating high school seniors and “Promise for the Future” scholarships to the mentees. This scholarship exists to help ensure that each mentee who graduates from high school and enters an institution of higher learning (four-year college, two-year college, trade school, etc.) will have meaningful financial support to begin that phase of his education and life. Ensure that each mentee receives a quality educational experience that prepares him for success in life. Assist mentees’ parents with their efforts to encourage the mentee to pursue academic excellence. Provide mentees open and confidential forums in which to express concerns and ideas about their educational experiences, goals, challenges, and opportunities. Offer educational mentoring activities which are fun and complementary to those provided in the traditional school setting.